After his much-awaited return to ONE Championship ended in unfortunate fashion three months ago, Chinese martial arts ace Li Kai Wen is preparing to make a definitive statement as he makes his first trip to the cage this 2018. The man known as “The Underdog” is scheduled to duke it out with the Philippines’ Roel “Akiyama” Rosauro in a three-round featherweight affair on the undercard of ONE: QUEST FOR GOLD, which takes place at the Thuwunna Indoor Stadium in Yangon, Myanmar on 23 February. “There is no way this bout will go to the judges,” the 22-year-old Tianjin, China resident stated confidently. “I believe that I am more athletically gifted than my opponent, and I believe that my team of coaches are more diverse. I am prepared for whatever he brings. With that said, I will enter the cage, implement my skills, and impose my will,” Li added. 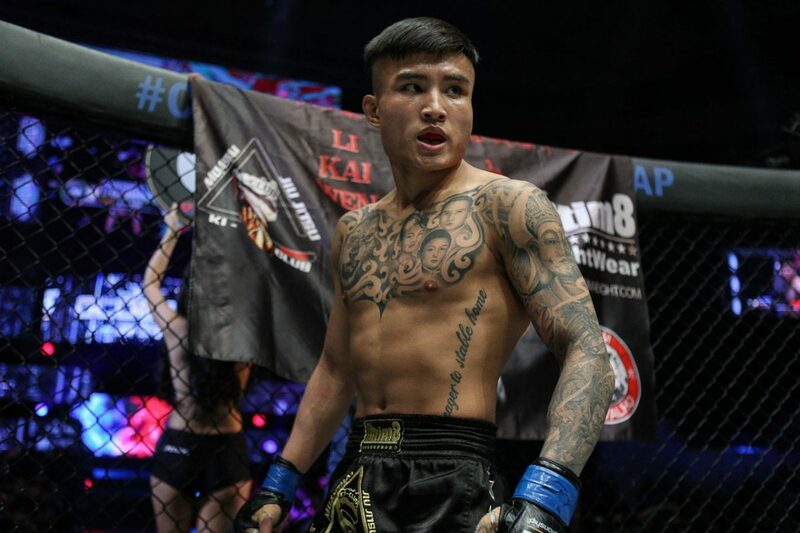 Back in November, Li graced the ONE Championship cage for the first time in nearly a year and a half when he took on Pakistani featherweight Ahmed “Wolverine” Mujtaba at ONE: IMMORTAL PURSUIT in Singapore. Although there was plenty of attention on the bout as both talents are young, aggressive, and known to constantly push the pace, it was marred by controversy. A series of illegal blows to the back of Mujtaba’s head stopped the match in the opening minutes of round one, and ultimately resulted in Li’s disqualification. While others sink into obscurity after being tainted by a disqualification loss, Li is determined not to fall into that category as he is eager to redeem himself on the global stage. “My loss last November is sweet,” he said, explaining that the defeat was a blessing in disguise. “It is sometimes better to feel that. You come to know that you have to work harder and harder. I have learned many things, and now I have more dedication and hunger for this sport,” Li further expounded. “I was born for tough situations. Deep in my heart, I know I can turn this setback into triumph. I am ready for anything,” he declared. To hone his craft in martial arts, Li trained at various facilities all across California in the United States as he visited stables such as Team Alpha Male in Sacramento, Millennia MMA in Rancho Cucamonga, and Kings MMA in Huntington Beach to stock his arsenal. Ready to showcase all that he has learned, Li believes that training in the United States will put his painful defeat behind him. “I would like to use this opportunity to demonstrate to the fans that I have kept training, and still pursued my dream of becoming a world champion,” he pointed out. Li was originally slated to face Rodian Menchavez at ONE: QUEST FOR GOLD, but the Filipino veteran was forced to withdraw from the contest due to an injury. Rosauro accepted the offer to step in for compatriot Menchavez and square off against an up-and-coming martial arts dynamo like Li in his promotional debut. “Roel Rosauro is my new opponent now, and I need to adopt quickly to his style. But our game plan is still the same, and I will execute that on 23 February,” Li bared. Because of the world-class training he has been receiving, Li is feeling extra confident, supposing that he holds the advantage in every area of the game. “I have better Brazilian Jiu-Jitsu and wrestling. I will outclass him in striking too. There is no pressure. I will step in the cage again, get the win and make the crowd go crazy,” he ended.